Arrive in Geneva and shuttle to Chamonix. We will spend the night in a hotel in Chamonix, France. Meet at 7:00 a.m. in the lobby of our hotel in Chamonix. We will spend today reviewing and practicing our rock climbing skills in our mountain boots. We will climb the Traverses of the Aig Crouchues above Chamonix. This traverse allows us to practice climbing uphill and descending. We spend the night at a hotel in Chamonix. Chamonix altitude: 1,000 m/3,280 ft.
Traverse Crouchues: 2,837 m/9,307 ft.
Vertical gain during day: 1,837 m/6,026 ft.
Vertical gain climbing: 637 m/2,089 ft.
We will depart Chamonix in the morning and head up the famous Aig du Midi lift to 3,800 m and, leaving the tramway, we will walk across the large glacier massif (Valle Blanche) over to the Traverse of the Entreves. This is a technical rock traverse mixed with snow, ice, and rock. This striking traverse has been photographed for many outdoor catalogs and magazines. We spend that night at Torino Hut. Chamonix altitude: 1,000 m/3,290 ft.
Top of Aig d’ Midi: 3,800 m/12,470 ft.
Traverse of Entreves: 3,604 m/11,824 ft.
Tornio Hut: 3,300 m/10,827 ft.
Vertical gain during the day: 2,800 m/9,186 ft.
Vertical gain climbing: 700 m/2,300 ft.
We will wake up early and leave the hut for an alpine start. We climb up the Dent du Geant (“Tooth of the Giant”). This peak is just over 4,000 m with an amazing summit. The “Tooth of the Giant” is not as well known as the Matterhorn, but the stunning ridge and shear beauty of this peak will not be forgotten. On this climb we get time to practice using fixed ropes and moving on technical terrain in our climbing boots. We spend the night at the Torino Hut. Tornio Hut altitude: 3,300 m/10,827 ft. Summit of Dent du Geant : 4,013 m/13,166 ft.
Vertical gain during the day: 713 m/2,350 ft.
Travel time climbing: 6-8 hours from Tornio Hut, round-trip. Walking back across the Valle Blanche in the morning, we then climb the famous Cosmiques Arete. This class alpine ridge line finishes back at the top of the Aig d’Midi, and provides another chance to practice our alpine rock climbing in boots. We will spend the night in Chamonix. In the afternoon we will get our equipment ready for the Matterhorn and go over logistics for traveling to Zermatt. Vertical gain climbing: 500 m/1,640 ft.
We start the day by traveling from Chamonix to Zermatt, either by train or by car. Travel time takes around 3.5 hours. Upon arriving in Zermatt, we will drop our luggage off at the hotel where we’ll stay on the way back from the Matterhorn. We depart Zermatt mid-day and approach the base of the Hornligrate Ridge, where we ride the Schwarzee lift to 2,575 m. From the top of the lift we travel by foot on a main hiking path to the Hornli Hütte at 3,260 m. We will enjoy dinner and go to bed early in preparation for our ascent. In the afternoon, climbers and guides can possibly preview the lower section of the route, if conditions and time permit. This day can also be a potential weather day, then moving to the Hornli Hut on Day 7 and attempting the summit on Day 8. Zermatt altitude: 1,608 m/5,275 ft.
Top of Schwarzee lift: 2,575 m/8,448 ft.
Hornli Hütte: 3,260 m/10,695 ft.
Vertical gain during the day: 1,652 m/5,419 ft.
Vertical gain climbing: 685 m/2,247 ft.
Travel time climbing: 2- 2.5 hours walking on trail to the Hornli Hütte. Summit Day! 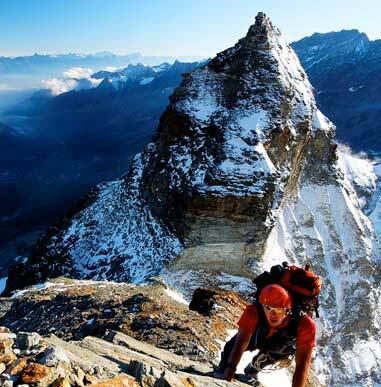 Climb the Matterhorn via Hornligrate Ridge, just over 1,200 m (4,000 ft.). This is a technical ridge climb requiring a high level of physical energy and technical ability. The lower two-thirds of the route involve a rock climb and rock scramble. We will take our first long break at the historic Solvay emergency shelter (4,003 m). Climbers should plan on reaching this hut in 2–2.5 hours. With only 475 m until we reach the summit from the Solvay, the route steepens as we ascend the upper Mossey Slabs. The final 200 m of the Matterhorn is on steep snow and ice before attaining the final summit ridge. Our goal is to reach the summit in 4.5–5.5 hours and then reverse our path and descend to the Hornligrate Hut. We will spend the night back at the Hornligrate Hut or in Zermatt. Climbers should plan on an 8-11 hour day of intense high-cardio physical exercise. Hornli Hütte altitude: 3,260 m/10,695 ft.
Solvay Emergency Shelter: 4,003 m/13,133 ft. Summit of Matterhorn: 4,478 m/14,691 ft.
Vertical gain during day: 1,224 m/4,015 ft.
Vertical gain climbing: 1,224 m/4,015 ft.
Travel time climbing: 4.5–5.5 hours to the summit and around 4.5–5.5 hours to descend to the Hornligrate Hütte. 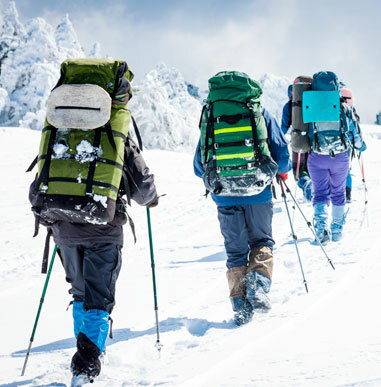 Total climbing time is typically between 9–11 hours, with 1–1.5 hours walking to the Schwarzee Hotel. Weather day or possible extra summit day on the Matterhorn. Over the years this day has proved to be beneficial to many of our climbers as we sometimes need to wait 12-24 hours for the weather to allow for a summit attempt on the Matterhorn. Overnight in Zermatt. Depart Zermatt via train to Geneva or Zurich. When booking flights, climbers should be aware the train ride is 4–4.5 hours. The first train departs around 5 a.m. Fly back to country of origin. 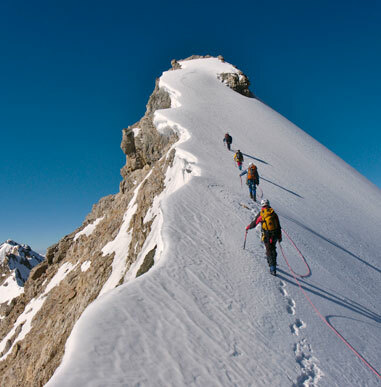 *Guides might change the Itinerary due to weather and climbing conditions on the Matterhorn.